Expyriment is a Python library in which makes the programming of Psychology experiments a lot easier than using Python. It contains classes and methods for creating fixation cross’, visual stimuli, collecting responses, etc (see my video how-to: Expyriment Tutorial: Creating a Flanker Task using Python on Youtube if you want to learn more). Modular Psychophysics is a collection of tools that aims to implement a modular approach to Psychophysics. It enables us to write experiments in different languages. As far as I understand, you can use both MATLAB and R to control your experiments. That is, the timeline of the experiment can be carried out in another language (e.g., MATLAB). However, it seems like the experiments are created using Python. Your experiments can be run both locally and over networks. Have yet to test this out. OpenSesame is a Python application. Using OpenSesame one can create Psychology experiments. It has a graphical user interface (GUI) that allows the user to drag and drop objects on a timeline. More advanced experimental designs can be implemented using inline Python scripts. 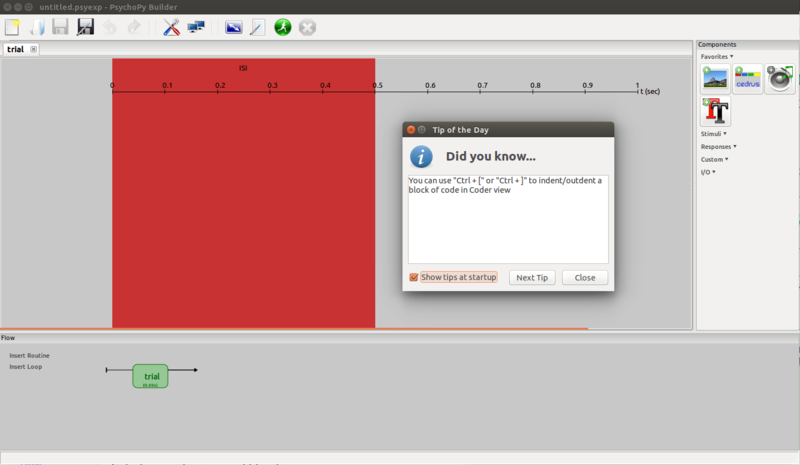 PsychoPy is also a Python application for creating Psychology experiments. It comes packed with a GUI but the API can also be used for writing Python scripts. I have written a bit more thoroughly about PsychoPy: PsychoPy. In the latest version of Psychopy we can now also build online experiments! PsychoPy GUI for a drag-and-drop creation of experiments. I have written more extensively on Expyriment, PsychoPy, Opensesame, and some other libraries for creating experiment in my post Python apps and libraries for creating experiments. Psisignifit is a toolbox that allows you to fit psychometric functions. Further, hypotheses about psychometric data can be tested. Psisignfit allows for full Bayesian analysis of psychometric functions that includes Bayesian model selection and goodness of fit evaluation among other great things. Pygaze is a Python library for eye-tracking data & experiments. It works as a wrapper around many other Python packages (e.g., PsychoPy, Tobii SDK). Pygaze can also, through plugins, be used from within OpenSesame. General Recognition Theory (GRT) is a fork of a MATLAB toolbox. GRT is ” a multi-dimensional version of signal detection theory.” (see link for more information). MNE is a library designed for processing electroencephalography (EEG) and magnetoencephalography (MEG) data. Collected data can be preprocessed and denoised. Time-frequency analysis and statistical testing can be carried out. MNE can also be used to apply some machine learning algorithms. Although, mainly focused on EEG and MEG data some of the statistical tests in this library can probably be used to analyse behavioural data (e.g., ANOVA). PyMC. Using Kabuki you will get formatted summary statistics, posterior plots, and many more. There is, further, a function to generate data from a formulated model. It seems that there is an intention to add more commonly used statistical tests (i.e., Bayesian ANOVA) in the future! NIPY: “Welcome to NIPY. We are a community of practice devoted to the use of the Python programming language in the analysis of neuroimaging data”. Here different packages for brain imaging data can be found. Although, many of the above libraries probably can be used within other research fields there are also more libraries for pure statistics & visualisation. PyMVPA is a Python library for MultiVariate Pattern Analysis. It enables statistical learning analyses of big data. This may be suitable for brain imaging data. Pandas is a Python library for fast, flexible and expressive data structures. Researchers and analysists with an R background will find Pandas data frame objects very similar to Rs. Data can be manipulated, summarised, and some descriptive analysis can be carried out (e.g., see Descriptive Statistics Using Python for some examples using Pandas). Recently, I’ve also written a Pandas DataFrame Tutorial. Make sure to check it out. Statsmodels is a Python library for data exploration, estimation of statistical models, and statistical tests. An extensive list of descriptive statistics, statistical tests, plotting functions, and result statistics are available for different types of data and each estimator. Among many methods regression, generalized linear, and non-parametric tests can be carried out using statsmodels. Pyvttbl is a library for creating Pivot tables. One can further process data and carry out statistical computations using Pyvttbl. Sadly, it seems like it is not updated anymore and is not compatible with other packages (e.g., Pandas). If you are interested in how to carry out repeated measures ANOVAs in Python this is a package that enables these kind of analysis (e.g., see Repeated Measures ANOVA using Python and Two-way ANOVA for Repeated Measures using Python). There are many Python libraries for visualisation of data. Below are the ones I have worked with. Note, pandas and statsmodels also provides methods for plotting data. All three libraries are compatible with Pandas which makes data manipulation and visualisation very easy. Matplotlib is a package for creating two-dimensional plots. Seaborn is a library based on Matplotlib. 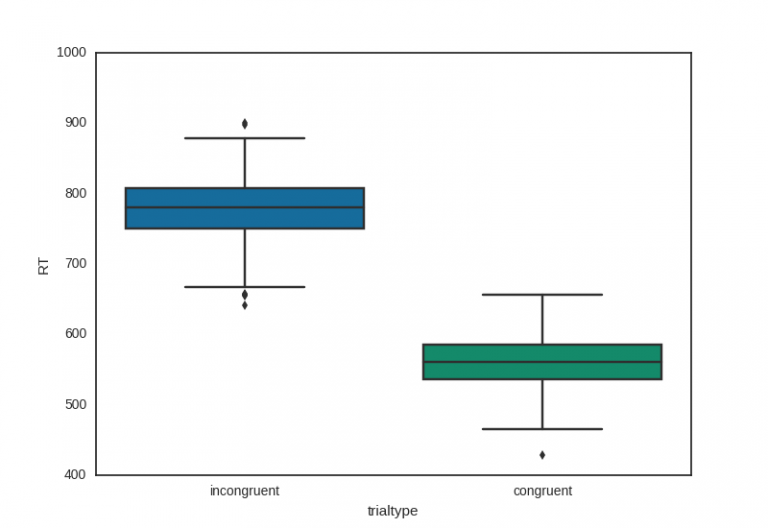 Using seaborn you can create ready-to-publish graphics (e.g., see the Figure above for a boxplot on some response time data). I have also used Seaborn to visualize response time distributions. Watch the Python Data Visualization Tutorial: How to Create a Scatter Plot on YouTube and you will learn how to create scattergraphs using Pandas and Seaborn. Ggplot is a visualisation library based on the R package Ggplot2. That is, if you are familiar with R and Ggplot2 transitioning to Python and the package Ggplot will be easy. Many of the libraries for analysis and visualisation can be installed separately and, more or less, individually . I do however recommend that you install a scientific Python distribution. This way you will get all you need (and much more) by one click (e.g., Pandas, Matplotlib, NumPy, Statsmodels, Seaborn). I suggest you have a look at the distributions Anaconda or Python(x, y). Note, that installing Python(x, y) will give you the Python IDE Spyder. The last Python package for Psychology I am going to list is PsychoPy_ext. Although, PsychoPy_ext may be considered a library for building experiments it seems like the general aim behind the package is to make reproducible research easier. That is, analysis and plotting of the experiments can be carried out. I also think it is interesting that there seems to be a way to autorun experiments (a neat function I know that e-prime have, for instance). That was it, if you happen to know any other Python libraries or applications with a focus on Psychology (e.g., psychophysics) or for statistical methods. Drop a line if you know any useful Python packages that can be useful for psychologists! Nice ! Thank you very much! This page was very helpful. But i got a question. Do any of those libraries have a function to work with Likert scales? I’m writing a code for a future app that is a Likert Questionnaire. I think it’s possible to work with Likert scales in OpenSesame but also some of the others, of coures.